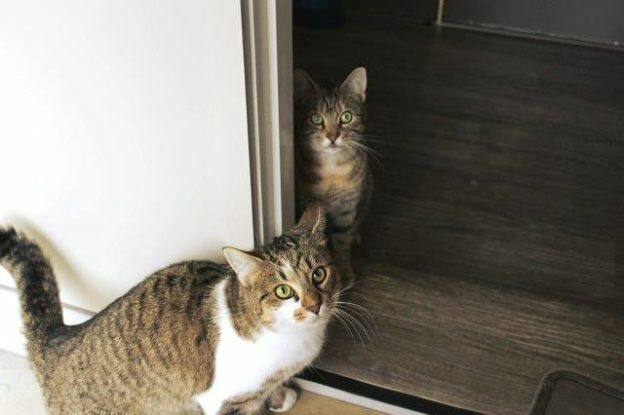 Sarah and Norah are about 3 years old and were surrendered to CPL when their owners went into care. They are housemates and, we think, also sisters. Tabby and white Sarah is the more confident. She enjoys attention and is happy to interact with other cats, dogs (please note that if you have a dog we will ask you to bring it to meet Sarah and Norah before agreeing to an adoption) and children. Tabby Norah is more shy and, as she is quite dependent on Sarah, we would prefer them to be adopted as a pair.